After starting the year in the bullpen for both the Phillies and IronPigs, Lincoln has made six straight Triple-A starts. With two impressive outings last week, the right-hander is finally finding big-time success in the role after giving up a combined 11 runs in his final two outings (8 1/3 innings) of May. His one-hit, six-inning gem against his former teammates from Indianapolis on Saturday was his better of the pair. Although he's put up a 3.37 ERA in seven Triple-A starts compared to a 5.06 in five relief appearances, the 2006 fourth overall pick still says he'd rather be in the 'pen. "To be quite honest, I'd still prefer to be a reliever, but I'm here to do what they ask of me," he told MiLB.com. "Right now, that's to be a starting pitcher. Just mentality-wise, I think it better suits me. I'm able to go out there and be that bulldog and come into that big situation and get some outs. But pitching is pitching, and wherever they have me, that's what I'm going to be happy with." Due to a trip to the disabled list at the start of the season, Mortensen didn't make his first appearance of 2014 with the Storm Chasers until May 28. He's been making up for lost time ever since. He tossed six innings of scoreless ball, striking out six and issuing four hits and a walk, on Monday against Round Rock and followed it with five more solid innings in relief of rehabbing starter Bruce Chen on Sunday. The right-hander, acquired by the Royals from the Red Sox in exchange for Quintin Berry last year, hasn't given up a run in his first three appearances (16 innings), striking out 16 with eight hits and four walks allowed in that time. Ryan had a pitching performance of which even Greg Maddux could be jealous. Outside the stats you see above, the 6-foot-5 left-hander needed only 88 pitches (62 strikes) to complete the first shutout of his five-year Minor League career. It was the second straight scoreless performance for Ryan, who tossed seven two-hit frames June 1 against Reading. While he's not one to rack up the strikeouts (4.9 K/9 this season), he remains stingy as ever with a 2.33 BB/9 rate that nearly matches the 2.35 mark he put up last season with Class A Advanced Lakeland. This Biscuit is an innings-eater. By going 7 2/3 innings on Monday and seven frames on Saturday, Floro has not pitched fewer than seven innings in a start since May 6, a span of six straight outings. He could have perhaps gone even further Saturday against Pensacola, when he had thrown only 80 pitches, but was forced to stop after seven because of a doubleheader. The 23-year-old right-hander is 6-5 with a 3.42 ERA and leads the Southern League with a 0.99 BB/9 rate, a big reason behind his longevity. In 2012 and 2013, Rucisnki was pitching in the independent Frontier League. Now, he's a Texas League Pitcher of the Week showing that he's potentially capable of taking on the next level of the Minors. 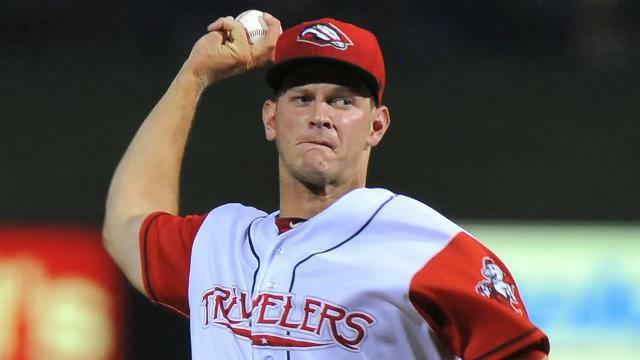 The 25-year-old right-hander, who signed with the Angels late last season after previously pitching in the Indians system back in 2011, notched the first shutout of his affiliated career Saturday. He is 4-4 with a 2.73 ERA (seventh-best in the Texas League), 55 strikeouts and a .237 batting average-against in 12 starts (62 2/3 innings) with the Travelers. It's tough to take to any kind of pitching role in High Desert, but Shankin is finding success in his first year as a Mavericks reliever. The right-hander came out of the bullpen with a pair of scoreless outings (3 1/3 innings against San Jose on Tuesday, 3 2/3 innings against Stockton on Sunday), lowering his season ERA to 3.06 in the process. His seven strikeouts against the Giants were a season high and his most since he fanned seven in 6 2/3 innings as a High Desert starter back on Aug. 28, 2012. A 2012 sixth-round pick out of Fresno State, Haley has been used out of the bullpen and as a spot starter with the Salem Red Sox and is one of only three Minor League pitchers with both a save and a shutout this season -- Syracuse's Taylor Hill and Burlington's Harrison Cooney being the others. The 6-foot-5 right-hander has enjoyed more success as a starter though (1.50 ERA, .219 average), as he showed last week against Frederick in his fifth start of the season. Haley ranks second in the Carolina League with a 1.96 ERA through 12 outings this season and was rewarded with a spot on the circuit's All-Star team last week. With warmer weather has come a hot Ynoa down in St. Lucie. The Mets' No. 14 prospect is 6-2 with a 3.45 ERA in 11 starts (62 2/3 innings this season) but shouldn't be judged on those numbers alone. He put up a 6.93 ERA in five April starts but was at the complete other end of the spectrum with a 1.45 mark in five starts in May. He started June off on the right foot by setting a career high in strikeouts against Dunedin on Friday. "Umpires are a little bit better here and hitters are better. As he works his way up, he is going to have to keep making adjustments," Mets pitching coach Phil Regan told MiLB.com. "He just has to have more games like tonight, where he is consistent." With a 1.29 ERA in his first six outings, Loconsole showed the Bees he was capable of taking over the closer's role if called upon. So when he got the final call twice last week, the 23-year-old right-hander ran with it, notching a pair of perfect, two-inning saves Wednesday and Sunday. In fact, he was nearly perfect all week with only one walk on Monday keeping him from a pristine trio of appearances. Lonconsole owns a 0.92 ERA, 17 strikeouts and .186 average against in nine relief appearances this season. In the words of Milli Vanilli, you can blame it on the rain if you want, but Lowry's first career no-hitter -- and the first individual no-no for Kannapolis since June 10, 2003 -- had as much to do with the Intimidators' starter as it did the weather. Making his fourth Class A start, the 2013 fifth-rounder also recorded his first scoreless outing of the season along with the first official career complete game and shutout. "I bet it's more glorious to have a nine-inning no-hitter, more official from baseball standards than five innings," Lowry told MiLB.com. "But it's great. I got my team the win tonight. It was a great experience." He is 1-3 with a 5.17 ERA over 15 2/3 innings in the Sally League.